Somewhere in the goings on that made my day, I ended up at a grocery store. To make a long story short, I havenât taken any pictures in a couple of weeks and was feeling like I needed to. Even if it was just one, so I put the camera in my coat pocket today. Getting out of the grocery store, I was again enjoying the warmth of the sun, the feeling of the brisk December cold, and really began to enjoy the quality of the light. The question however, is what would make for an interesting photo. 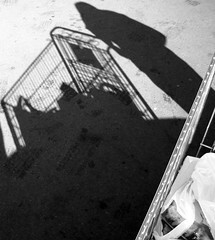 At that point I saw the shadow of the shopping cart. Perhaps it isnât the most glamorous photo in the world, but at least I managed to get one. Today started like most of my Saturday mornings. It was very beautiful outside, though there was frost on the grass and on my windshield this morning, the sun was warm and bright. Because of the rain we have had for the last couple of days, the sky was clear, and the air was clean. Today was the kind of day that helps you to remember what life is all about, the kind of day that restores your faith in good things to come. I ate at a new Mexican fast food restaurant today. I almost slipped into speaking Spanish. The food was excellent and spicy, just as I like it. I managed to finish my computer science assignment this afternoon. I feel like a great burden has been lifted off of my shoulders. With that assignment taken care of, the path is now clear for me to study hard for finals. First thing on the radar is ODE's, then Discrete Math, and then Computer Science. However, because Discrete Math and Computer Science fall on the same day, I am going to have to devise some way to make sure that they both get adequate study time. I think it means I will be taking some time off of work this week. I want to do well. I want to get accepted into this program. Few times in my life have I been so insistent about something happening. Letâs hope that it shows in my grades, and that the admissions board feels I am worthy.